This year, the family has started a new tradition – that when all of us are in town, we will sit down and have Sunday brunch together. There’s something about brunch that gets me excited – a great cup of coffee, rich and creamy eggs, something spicy to wake me up, or something sweet to remind me of our childhood pancakes. More than anything, it’s a way for us to come together and share stories and genuinely enjoy the great company and food. This past weekend, we had AMAZING weather in Nashville to where temps were up in the 60’s! So, we sat outside on Sunday morning and had a great brunch before everyone left for the day’s activities. I love brunch dishes on the savory side, as we are inevitably late brunchers. 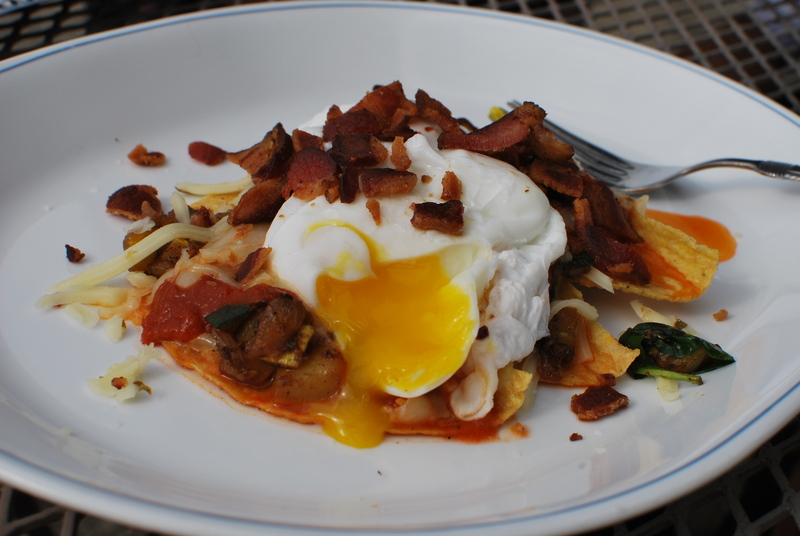 This is my take on huevos rancheros. I substitute sauteed vegetables for the beans and used bacon instead of chorizo. Although some of you following my charcutepalooza posts/tweets may wonder if this is some of my homemade bacon. Unfortunately it is not (as it was not done curing when we had this meal). It is, however, some fantastic bacon made by a great Tennessean – Allan Benton. Mr Benton makes some of the best bacon in the country, as far as I’m concerned. I even heard that superstar chef David Chang (of the Momofuku empire) orders 400 lbs (!!) of Benton’s bacon a week. That’s a lot of pork. Order yourself some, here, as I think you’ll really enjoy it. While I’m writing this post, my homemade bacon has been completed. It’s delicious….like it’s REALLY delicious. I might have to share with some of you Nashvillians! I don’t have a huge amount, but if you are interested, let me know, and I’ll see if I can give you a little bit. This dish has a few different components, but the idea is to start them and multitask. That is the key to a good brunch – get your coffee and get a lot of stuff going. As long as you stay organized, this is easy. Bring a large, wide pan filled with water to a simmer. Season the water with the vinegar – this will ensure the egg whites coagulate around the yolk when you poach the eggs. Crack the eggs and put them into individual bowls (or crack one at a time). When the water returns to a simmer, use a slotted spoon and start stirring the water clockwise until there is a bit of a vortex in the middle of the pot. Drop one egg into the middle of the vortex and watch as the egg white comes to surround the yolk. Let the egg cook for about 3 minutes, and then immediately transfer to a bowl of ice water to stop the cooking process. At this point, your egg is almost perfectly cooked. Repeat with remaining eggs. When you are ready to serve, insert the eggs back in the poaching liquid for about 45 seconds so they warm all the way through. This will result in great, runny yolks. If you want a hard yolk, just cook it longer, for about 2 minutes. Add some oil to a fry pan and coat to cover the bottom. Add the onion, season with salt and pepper and let cook until soft and translucent. Add the garlic and chipotle chiles and cook for a minute until fragrant. Add the oregano and tomatoes, and season with salt and pepper again. Let cook for about 20 minutes on simmer. You can puree the sauce in a blender or just leave it chunky (but use a potato masher to break up the tomatoes). Then add the lime juice and cilantro at the end. Keep the sauce on simmer until ready to serve. Coat a fry pan with a thin layer of oil over high heat. Add the onion, zucchini, and squash, season them, and cook for a few minutes until the vegetables are starting to brown on the edges. Add the garlic, cumin, coriander, chile powder, and cayenne pepper and toss to ensure even coating over the vegetables. When the vegetables are cooked well – as in they have a little bite and are not overly mushy, add the lime juice, cilantro, and season again with salt and pepper to taste. Set aside for assembly. Now that you have all the components, the assembly part is easy. First, put one crispy tortilla shell on the plate. Put however much shredded cheese you like on top of it. Cover with the vegetables. Add some of the sauce. Cover with the poached egg. 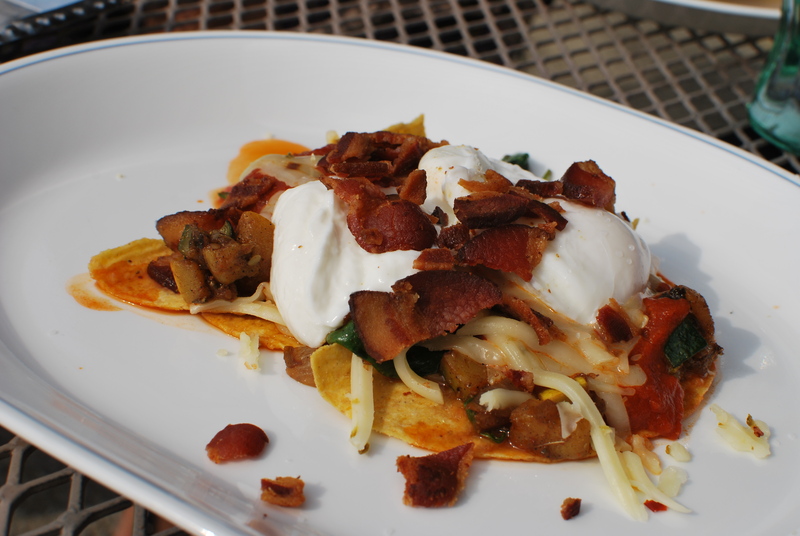 Garnish with some sour cream, bacon pieces, more cheese, and cilantro. Hope you enjoy this wonderful brunch – I look forward to sharing some good stories from ours soon.